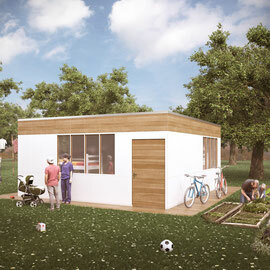 A living space for eight people, all-weather, in total cost of around 11,000,- Euro! About a sum of this costs a federal pension the private accommodation of eight residents in just three months. In stacked block construction can find up to 48 people per unit living space. However, this construction method can also remedy urban and rural housing needs. It enables architecturally variable creative freedom, with enormous resource conservation. The Thermo-Module solution shown here can be easily prefabricated in tinsmith or roofing companies. Outer wall-side 0.7 mm thick aluminum sheets and inside 0.5 mm thick zinc plates (or wood-clad) can in simple workshops be made there into sandwich components - and in unit with their heat-insulating window - framed in elastomeric sealing. Such insulated prefabricated parts are built to visually discreet thermal buildings, which also score in terms of a desirable noise shield. What makes the module to a sustainable thermal wall? These are the standing wood: between the two sheets and 3 insulation layers, these are installed with the appropriate thickness. With 20 cm thick wall construction, floor-mounted building modules can already be produced. Example: One or two floors can be reached via a central staircase that connects two houses. Per building complex will be created for 32 to 48 people a residential accommodation. If necessary, a residential unit can also offer Singeln space partitioning. The solution for a slim wall with optimized insulation of only 20 cm lies here in the layer structure: between two sheets, three mineral clamping felt mats are interspersed by two aluminum-foiled corrugated cardboard sheets. As a result, clearly defined air convection fields are formed. The 3 mats result in a considerable advantage over an equally strong single mat: only one 20 mm mat results in unrestricted air circulation with undesirable heat transport. These layers can of course also be installed to greater wall depths. How does it come from underground to wall construction up to the building? The flood-proof flat building ground is covered with 7,80 x 8,45 m pond foil. On the edge of a 60 cm wide and 12 cm thick Styrofoam framing is placed. The subsoil below this Styrofoam frame is previously leveled with sand. The styrofoam laid thereon is then covered with thin coarse chipboard. These panels are then, all around, covered with over the edge of wide PVC tarpaulin, and are therefore weatherproof and walkable. The four finished modules (2/ 1 mx 6.54 m and 2/ 1 x 7.19 m) are being erected on this inner styrofoam edge. The four 1.5 m high modules that shelter the windows follow. The inner free or living space gets a 4 x 20 cm wooden substructure *, as a basis for laid on the vessel floor fields. The covered construction area thus remains dry and frost-free and makes the constantly increasing geothermal heat of ~ 9 ° C usable. This type of ground cover is a good solution, especially in cold climates. The statically supporting inner skeleton consists of 2.5 x 20 cm strong wodden stools, which protrude in cheek to cheek distance of 61.5 cm. Furthermore, the uprights are bordered and connected at both ends by 4 x 20 cm thick and correspondingly long cross blades. In the interframe structure, five layers of felt mat (a'4 cm thick, 62.5 cm wide) alternate with four corrugated boxes, each with a thickness of 3 mm, as stacked separating layers in form-fitting embedding. The 4 boxes and five mats prevent large-scale thermal transfers as spatial barriers. Even if this construction requires working hours, their costs pay off over the lifetime heating and cooling costs. The wooden skeleton is, as I said, sandwiched with aluminum or cinksheeds. Previously, the modules are distributed in portions of distributed zeolite sachets - for binding condensation moisture - attached. Sheets and frame pellets are then bonded elastically 3 cm wide at the edges. Also, roofing nails ensure a solid wooden frame / sheet metal connection. In the end, each thermo module is a load-stable and windproof unit. So that the silicone is not displaced, a several number of wooden sticks (3x3x200mm) is interposed. The inclined by 3 ° flat roof should be at least 35 cm thick. The weather side 1.5 mm thick aluminum sheet may - in absence of regional power grid - also covered with CIGIS PV roof foil, for example from Alwitra, Evalon-solar®. The harvested on the demand energy could flow in deep cycle solar batteries. This e-network freedom would - together with a corresponding battery, controller and 12 volt consumers - cost about 2.300.- Euro more. The first bare metal sheets are coated with inner and outer dispersion in calm tones. 14 pieces, only with felt strips framed thermal insulation windows (0.6 m x 1 m) give a well-distributed daylight. Due to interval automatic ventilation * the windows can not be opened; their usual framing would make them 70% more expensive. However, three-rotor discs with U-value 0.7 - for the price of about one hundred euros each m² - pay for themselves in a short time! A decorative envelope with aluminum foil inlay can be attached to the edge of the window with snaps on the outside or inside. These curtains support the radiation thermal regulation on hot summer days or in cold winter nights. Because it has only 45 m² of living space inside, there are bunk beds for the children. The 160 cm wide bed for the parents and possibly the grandparents could be folded up during the day. Stackable chairs also create enough space in a nutshell; and simple folding walls or screens create privacy. An all-round rack with a ceiling height of 2 m makes bulky cabinets unnecessary; subtle curtains hide everything here. In a black tube collector hot water could be prepared and stored in a roof tank. The collector could also get the kitchen and shower via the local drinking water supply. In any case, solar hot water preparation will pay for itself in the short term. The double-wing front door (65x190x12 cm x 2) is constructed like the wall insulation. One of the wings has a self-closing screen door. Heated and cooked in cloudy weather may be with gas. In sunshine, in front of the house, a high power solar cooker of e.g. sun-and-ice® to be cooked. This can also be a simple hot water heating circuit in the living room into it. A sun / rain sail in front of the front door also offers about 20 m² of utility as well as children's play room. A small vegetable garden also conveys a sense of security and a feeling of home. A building plot should have at least 200 m² of land. If necessary, the wastewater feeds a biologically cleansing gravel / plant clarifier. There, the outdoor toilet would be well placed. The roof drainage could be collected and used as process water or flow into the clarifier. For storm-grip, two anchors are sunk per outer corner **. The Faraday construction together with the earth anchorage makes a lightning protection system unnecessary. If necessary, the building should be built on stilts (for example in case of frequent floods or in mountain snow conditions). What is the benefit here? # The rockwool and board insulation processed here is considered to be much more ecological in production and end-use, as opposed to iso-foams based on petroleum witch usual in containers, and is the first therefore preferred. # Low costs, short construction time, suitability for settlement and the low demand for resources speak in favor of using this method of construction. # The 8 wall, 5 roof and 4 floor components can be transferred in just one truck load. Otherwise, they can be rebuilt in the same way by means of roofing silicone grouting. # The buildings should also be able to withstand a middle earthquake without damage. # The non-flammable and termite-resistant wall structures offer high residential safety. # As a low energy house, funds may also be received from a construction cost subsidy. # As a allotment house, it can be installed by the module manufacturer without a builder. # In this lightweight class, with only 20 cm wall thickness, a relatively good U-value would be achieved. # Small space requirement on the stock pile. # As a small, foundation-free and easily dismantled structure, this construction method has only a few building regulations to follow. Who needs this construction ? In order to provide adequate remedies for the international law mandate of the acute distress of large numbers of refugees, an army and federal supply system needs structural alternatives to expensive housing. UNHCR, ICRC, Caritas and similar aid organizations could also supply one or two buildings in this finished part stacks per truck delivery. Also, the construction approach is well suited to rapid reconstruction after wartime or earthquake regions - in the context of regionally executable utilities. ... to two living containers each 21 m², one of them with sanitary ware, with a manufacturer's original price of ~ 25,000.- Euro, this concept has significant cost advantage. The modules are more mobile in terms of transport and storage. The rooms also offer more usable living space and comfort with lower heating costs. Container solutions often have the character of barrack-like, clumsy temporary restorations in addition to the difficulty of being able to be transferred. The material list: an overview, what this low-rise building includes. (With current prices on the German market). Material total: about 10,500 €. Without PV system, € 2,250 less; excl. Mains power connection about 8,750 €. With the cost of the work (about 2,750 euros for a tinsmith and two helpers in three days prefabrication, and a day for the establishment) comes to a total price of about 11,280 euros including VAT. A mobiliare equipment is not listed here. Also, any land lease and electricity and water connection costs are not included in this calculation. Dimensions: Inside 6,54 x 6,87 x 2,50 m / outside 6,86 x 7,19 x 2,9 m; Inside area 44.8 m² - outside 49.1 m²; Circumference 27.2 m; Total window area 9.6 m². The 5 roof and 8 wall modules as well as 4 floor parts each weigh approx. 80 kg. The total building weight is about 1.4 tons. In principle, all States should create their own-produced quota at this or a similar type Family-, Scoolroom- and Hospital accommodation. For this purpose, some countries need to be helped with concrete development aid by the international community. The human dignity and right of residential must remain protected! I'm always interested on experiences with my projects and look forward to your feedback: Tel +43 1 9195724. Please convey this project approach through recommending, link exchange of my side www.tubewaysolar.at and by promoting to regional standardized mass production - thank you ! Sie und jede Firma können diese Ansätze zu einer Produktlinie Ihrer Marke ausbauen. Keine Patente, keine strikten Bedingungen. Zuwendungen aus Gewinnerlösen nehme ich gerne an. You and every Company can these approaches expand to an product line of its trademark. No patents - no strict conditions. I would like to receive donations from winners. Ich bitte all jene, die NICHT mehr über Aktivitäten von TubeWay solar informiert werden wollen, um eine eMail mit dem Betreff "unsubscribe". I ask all those who want NO more to be informed of activities of TubeWay solar to send an email with the subject "unsubscribe".